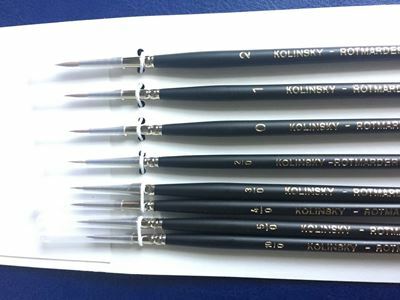 The set of brushes consists of 8 Kolinsky Sable paint brushes. And comes mounted on a stiff card backing with proctective covers for the hairs. Set of 6 Size 10/0 Kolinsky Sable hair paint brushes. The set contains 6 size 10/0 brushes. Set of 6 Size 0 Kolinsky Sable hair paint brushes. The set contains 6 size 0 brushes. Set of 6 Size 1 Kolinsky Sable hair paint brushes. The set contains 6 size 1 brushes. Set of 6 Size 2 Kolinsky Sable hair paint brushes. The set contains 6 size 2 brushes. Set of 6 Size 3 Kolinsky Sable hair paint brushes. The set contains 6 size 3 brushes. Set of 6 Size 2/0 Kolinsky Sable hair paint brushes. The set contains 6 size 2/0 brushes. Set of 6 Size 3/0 Kolinsky Sable hair paint brushes. The set contains 6 size 3/0 brushes. Set of 6 Size 4/0 Kolinsky Sable hair paint brushes. The set contains 6 size 4/0 brushes. Set of 6 Size 5/0 Kolinsky Sable hair aint brushes. The set contains 6 size 5/0 brushes.